Snakes and Ladders is one of those board games that feels like it’s been around for ever. It therefore seems like possibly a bit of a strange one to be the subject of a blog post, but please bear with me on this one. A few months back Bonn and I came across a copy of it at a car boot sale that we stumbled across on our way back from Harwich on bank holiday Monday. I seem to recall that it didn’t cost very much and, as I feel like I’m very much having to restock all the toys and games I have for my kids since splitting from their Dad, I decided to grab a copy. I’m so glad I did. The game came home with us, ended up on the shelf with some other games and to be honest I didn’t give it much more thought at first. Then, as the weather started to improve, Master C and I took to going and sitting at one of the picnic benches in his school playground in a morning, whilst we waited for the school bell to ring. On that particular table is a giant version of Snake and Ladders and we started passing the time in a morning by me rolling an imaginary die and him moving an imaginary counter round the board in an attempt to win before the bell went. One morning I happened to mention to him that we had a real copy of the game at home and his eyes nearly popped out of his head. Bad mum for not telling him sooner I guess! Since then the pair of us have ended up playing Snake and Ladders quite regularly. It’s made me realise what a wonderful game it is for a child his age. On so many different levels. Firstly, and this almost goes without saying, board games are a wonderful way to engage with your kids. Conversations can happen whilst you’re playing. It’s like the action of playing a game means that children somehow forget that they normally don’t tell you anything about their day at school. It’s also proper focussed time with them. No opportunity to pick up your phone and end up down a social media rabbit hole when you’re having to take turns. A game like Snakes and Ladders also introduces children to so many different things. There’s the whole concept of taking turns. It may seem obvious to us as adults, but it’s a skill that children need to learn. There’s maths involved in rolling the die, counting the dots on the surface and then moving a playing piece the right number of spaces on the board. Regular playing of board games can help a child so much with some of what they are more formally taught in the classroom. In a game like Snakes and Ladders there are rules to follow. If you land on the bottom of a ladder you go up it, if you land on a snake’s head you go down it. Simple rules, but again another concept that it’s important for children to learn. And finally, there’s the fact that sometimes you win and sometimes you lose. As I’ve discovered, it’s very difficult to cheat in Snakes and Ladders, short of not rolling the die correctly. It’s totally random as to what you land on and this means that whoever is playing has an equal chance of winning. There’s no strategy involved. 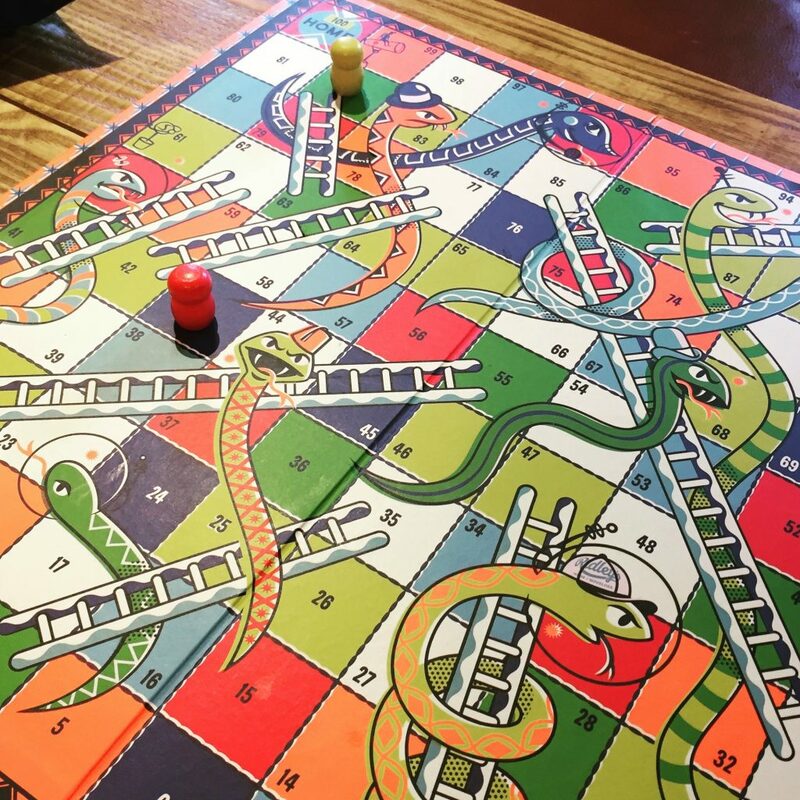 After the initial disappointment of going down their first snake, children soon realise that even mummy can end up landing on a snake on the final row of the board and soon be back to the beginning. And how Master C laughs whenever that happens! Interestingly the version of Snakes and Ladders that we picked up came with Ludo on the reverse of the board. A game that I vaguely remembered from childhood and one that I assumed was equally as fair as Snakes and Ladders. How wrong I was! Look out for a whole separate blog post about this game and why it’s apparently called “Man, don’t get annoyed!” in some parts of the world! It goes without saying that there are numerous versions of Snakes and Ladders out there. You can find a wide selection online here.